There is a check box in the Systems Setting - Startup page. However it is grayed out. Is there a way to enable this feature? From time to time my Windows 10 host may reboot - and DCS-100 won't run until I login. It would be really nice to be able to start main console automatically. What version of DVC do you have installed? I'm using DVC version 4.2.1. Sure there is a "run as service" feature.... It will start it up before you log in. Works fine for me. You need to have the auto login enabled. Are you referring to a Service feature of DVC that can be enabled or just enable auto log in for the PCs users account to let the program auto start? There is a run as service feature. 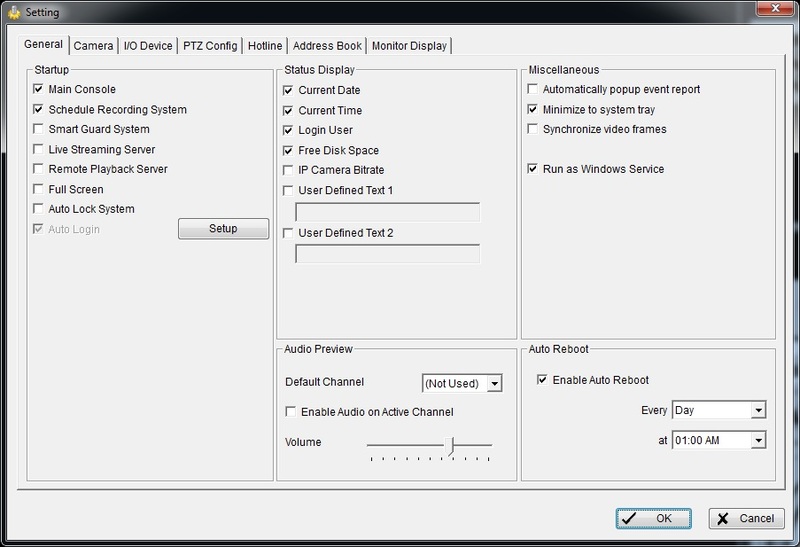 With this turned on, along with the auto login (within DVC, not Windows), the main console and recording will start when the computer is turned on and nobody is logged into Windows. You do not need to setup Windows to auto logon to an account for this to work. You do not need to disable UAC. It must be a new feature with 4.2.1 I can't find a manual for the program for the new version that shows the feature. Nothing like no documentation to make life simple. Awesome. Thank for you for confirming this. Here is the main setup screen that shows the new options. No idea why it did not make it to the new manual. Thanks for posting. I can confirm this as well. The latest manual (4.20) was for version 4.1.1. I will send a request for an update. This is what happened in my settings. Like I said in the initial post - the "Run as Windows Service" being grayed out. Did you run D-ViewCam as administrator? Let me install it and see if I can duplicate the issue.